They could be here in less than 10 years. In the case of nuclear power plants, one company thinks bigger isn’t always better. NuScale Power has just submitted a design for a ‘miniature’ version of traditional plants. Of course, “miniature” in this case is relative to the sprawling complex that is typical of nuclear power plants. But considering NuScale Power is reducing hectares into a structure that can fit on a flat-bed truck (roughly nine-stories tall) the design is a feat unto itself. NuScale Power’s concept is anchored on a modular design that will require assembly at designated facilities before it is delivered to power utilities. The module will house a self-contained, 50-megawatt nuclear reactor with uranium reactor fuel. A plant will likely require several of these modules operating simultaneously, and will still require nuclear engineers to operate, but with other significant advantages. Given the size, it will require less uranium fuel, which minimizes the risk of massive meltdowns. As an added safety feature, the uranium is not only housed in a special containment vessel, it will also be submerged in water. 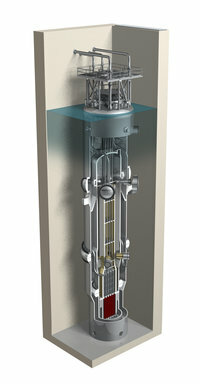 And to avoid disasters similar to Fukushima, where the pumps used to circulate the water failed, the miniature reactor will use natural convection. NuScale Power says that their design makes it a far safer and cheaper option than any of the existing plants today. For instance, Tennessee’s 1,150-megawatt reactor cost $4.7 billion to build. While it’s fully operational now, it was bogged down by years of construction delays. In contrast, NuScale Power believes that a 570-megawatt project is possible for less than $3 billion. A ‘miniaturized’ version of these plants could be used as backup for wind turbines, to provide alternative power on non-windy days; or given their portability, be used to provide power on military bases in the event of a grid failure. Like coal, nuclear power inspires much debate and controversy. The nuclear industry is so deeply steeped in negative misconceptions that it’s hard not to conjure images of mutated monsters and humans with extra limbs whenever it’s mentioned. Nuclear energy produces more clean-air energy than any other source and is the only one that can produce large amounts of electricity 24/7. Nuclear energy produces 62 percent of all U.S. emission-free electricity. In 2015, nuclear power plants prevented 564 million metric tons of carbon dioxide emissions, equal to the amount of carbon dioxide emissions from 128 million cars. Nearly one hundred power reactors in 30 states provide about 20 percent of all U.S. electricity. Nuclear energy generated 797 billion kilowatt-hours of electricity in 2015. It’s the waste that nuclear plants generate that gives them a bad rap. Nuclear waste is obviously highly radioactive and must be closely monitored and handled with the utmost care. This can theoretically be managed easier given NuScale’s design. But Ed Lyman, an analyst from the Union of Concerned Scientists raises the possibility that cutting corners in construction, including scaling down the size and strength of the reactor containment building, as well as reducing the team required to operate it, will compromise the safety of the reactor. NuScale Power’s Chief Commercial Officer, Mike McGough however asserts that their smaller, modular system makes it far safer than large reactors, thus eliminating the need for traditional structural components designed to protect the core. Right now, the design is undergoing stringent review by the NRC to ensure that NuScale’s design does indeed meet safety standards. This could take around three years, and if it passes, the company hopes to make its first modular, miniature plant operational by 2026.